Halloween is not just a festive season but a crucial time for small business owners to improve sales. Marking the offset of the holiday shopping period, it cracks infinite opportunities for small businesses. However, to stay competitive during this time, you should be business ready. Therefore, avail business financing, whenever necessary; review your business advertising efforts logically; promote creatively through social media, press releases, flyers, marketing apps, etc. to boost Halloween sales. If you are a small business owner, then Halloween is a demanding and significant time of the year for you. Here is what you can do to benefit from this Halloween. Running interesting events at your store or contests on your website and your business social media pages can fetch greater brand recognition. You can host Halloween-themed contests- best Halloween costume, innovative pumpkin carving, etc. Rewarding the winners, tempts more customers to participate and thus pumps up your business sales. You can take this little further by promoting the contests across various social platforms online with your business tagged. To perform better this Halloween, your business should be up to date. Therefore, repair existing equipment, buy new equipment (if needed), stock up supplies, renovate store, upgrade services, add further products, hire additional staff, invest in advertising and marketing, etc. However, if you lack the business working capital to cover up these expenses, get a business cash advance. Although there are many holiday loans available in the lending market, merchant cash advance is a dependable and affordable alternative to small business loans from banks. It offers quick, simple, secure and flexible business funding solution without any collateral requirement. Moreover, the online process encourages you to extend timely and effective services to your customers, apart from saving you time and efforts. Thus, it assists in perking up your sales. Give away some free stuff with your business logo or name on it. Ensure that the relevant treats are appealing to people of all ages. For example, if you are into the food business, you can offer cookies with your company logo or make it more fascinating by sharing pumpkin-spiced recipe ideas. 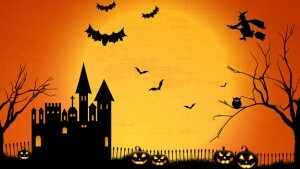 Dressing up your store or office in Halloween theme can undeniably and easily attract more passers-by. If you are short of time, run to your nearby dollar store and quickly grab some decorations. However, getting imaginative and decking up your storefront more devilishly in black and orange will pay off by all odds. An extraordinary storefront unquestionably allures the customers to click a picture along and share it on their individual social pages. Thus, your business logo gets all over the social media and creates business for you. If your business is online, then you can make your website spooky by adding spider webs or flying witches. Since, such an approach will drive more traffic to your website; make sure that you advertise your business’s new products and services, forthcoming offers, interesting blog posts, and other useful information. If your business is not offering free shipping presently, then promote free shipping for a limited period all through Halloween to attract hordes of customers. However, if you are already extending complimentary shipping, then endorse it with Halloween-themed banners over your business website and Facebook page. This may increase web traffic and in turn, boost sales. Prop up Halloween shopping through email marketing. Just gather your loyal customers’ email addresses or tempt your online customers to fill out their email addresses. Subsequently, send out Halloween themed emails underlining your business products- Halloween costumes, accessories, candies, decor, etc. Even if you do not have anything Halloween related to selling, you can simply run an all-purpose sale. Thus, understanding customers’ buying intents, their shopping approaches and employing easy and affordable ways, you can make a superfluous business around Halloween. However, do not miss the entertainment element while doing some serious promotion.